When heroic adventurer Rickard Bronson entered the Afterlife to recover and restore the ten stolen Cruciforms, and lock shut once more the Gates of Hell, he was successful in his most dangerous quest to date. But questions remained unanswered: who was responsible for the theft? And why? Now, the ancient order of the Brotherhood of the Gatekeepers has again summoned Rickard's aid. Can the daredevil explorer finally unmask the identity of the culprit and put a stop to their schemes once and for all, or do further mysteries and revelations lie in wait for Rickard upon his return to the Afterlife? Afterlife 2: Rickard's Journey is an epic, narrative platformer, in which Rickard Bronson returns to the Thirteen Realms of Hell to complete the journey of discovery he began in Afterlife: Rickard's Quest. Armed with his trusty hand-bombs and Deadly Hunting Umbrella, and aided by an assortment of arcane treasures looted from the Realms of Hell, can he put a stop to his mysterious foe's dastardly plans? 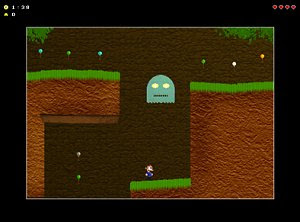 Afterlife 2: Rickard's Journey is provided as freeware. This means that you are cordially invited to download the game entirely for free! You should also feel very welcome to come and say hello at our forums, where you can discuss the game with other players or share your thoughts - we always love to hear from people who play our games! Above all, have fun, and we hope you enjoy playing Afterlife 2: Rickard's Journey!